Dattu Bhokanal speaks of his childhood home in Manmad, Maharashtra, without a trace of wistfulness. He gives us facts about his life then, precisely and matter-of-factly. It didn’t rain for weeks on end each summer. His father was a well-digger, one of dozens who helped bring fresh water to people’s homes and to land. They were poor, but they got by. As a boy Dattu went with his father on most of these expeditions. “All that exercise, the laborious work under the sun are responsible for the basic strength and endurance I have,” he says. He did not know then that this vast bank of stamina would be useful for grueling training sessions and world-class competitions in single scull rowing, years later. He had hoped to become a well-digger as well. “My foray into rowing was almost accidental. There is a story behind it,” he says seriously. Dattu’s father died without warning in 2011. The then 20-year-old son joined the Army to help his family make ends meet. He began training in Pune, and that’s where he was first noticed. 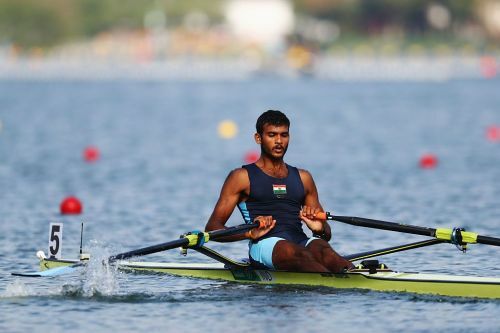 Dattu’s superior at the training center encouraged the young man to take a stab at rowing. He was over six feet tall and had an unusually wide wingspan, but he did not know how to swim. Not yet. Instructors had never met a student with more dogged perseverance, more keenness to learn and hone his newfound skills. Dattu learned, and he learned fast and well. In a year he could swim adroitly, and balance himself on his scull, rowing with mastery under relatively troubled conditions. He had no corporate sponsors yet, but he represented the Army at a number of national meets and by 2013, was consistently doing well. He won two gold medals at the National Rowing Championship, and a silver in the men’s single sculls at the Asian Rowing Championship in China in 2014. He represented the country at the Asian Games, again in China, in the same year. The only time we detect a tinge of emotion in Bhokanal’s tanned, weather-beaten face is when he begins to tell us about his stint at the Rio Olympics. He confesses that it was a troubled time for him, personally. He was due to leave for the Olympic qualifiers, upbeat and full of energy, when his mother had an accident that left her in an extended coma. The Army would take care of all medical expenses, but our sailor was finally starting to give in to the stress. His decision to go, or not, would affect his whole athletic career. It would also interfere with India’s chances of winning top awards at the Rio Olympics. “But I went. I had no choice. It was such a big opportunity,” he says. He gave it his best in the qualifiers, shoving the competition out of the way, and flew to Rio. At the biggest rowing event in the world, one he hadn’t heard of until he was past his teens, he finished 13th. The outcome may have been different had his mother not passed away while he was doing last-minute preparations in Brazil. Sports writers have conjectured that this unfortunate event, and its aftermath, affected his performance. He himself neither contests nor corroborates that line of thinking. “I was very upset. Once or twice I broke down. I was so far away from home.” This is all he will say about it. Journalists back home would ask him, weeks later, what went wrong. Dattu has been unprejudiced and steadfast in his answer. He had not trained with infrastructure that could compare favorably with his contenders’. He remained confident in his prowess as a rower, but he would need better, more refined priming to compete with any real chance at a gold in Tokyo in 2020. Dattu believes he can win an Olympic gold medal for India. His improved training, frequent travel and equipment will be expensive, but sponsorships are coming through. A large part of his finances is currently being taken care of by GoSports Foundation. However, lack of infrastructure has pushed Dattu to seek rowing lessons on foreign waters. His two-month training in Miami will teach him what can’t be taught in India. The exposure is important to help Dattu understand what he will be up against in 2020. In Rio, the lack of practice in rowing sideways became his Achilles heel, but Dattu is determined to overcome that in Tokyo. Nothing can stand in his way now - except perhaps the unavailability of funds. His training in Miami will come at a cost that a farmer’s son or an army subedar couldn’t even think of paying. But Dattu is also the nation’s best rower. His fundraiser here on online crowdfunding platform Impact Guru is not an appeal for charity; it is an appeal to cover his expenses in Miami. It is also an appeal for support, an appeal to empower India’s best chance at winning a gold in rowing. "Missing out on a medal was disappointing. But I have gone where no Indian has before. I have changed things and there is more to change. Give me three years more and I will get India a medal,” a brave Dattu says, reminding us that it is not just the player, but an entire nation that could win here.